Does the M-Track Eight require software drivers? What recording software does the M-Track Eight come with? Will the M-Track Eight work with other DAW software? Can I use an external microphone preamp or DI with the M-Track Eight? The LED lights on the front of the M-Track Eight do not light up all of the time. Have I set the levels properly? What value does each LED segment on the level meters signify? Which output on the back do I connect my speakers to? The sound from my Mac is very quiet, even when I turn the M-Track Eight up all the way! Is this normal? The M-Track Eight is very warm to the touch. Is this normal? The M-Track Eight comes with Steinberg's Cubase 7 LE software, making it ready to record eight channels at once and produce music out of the box. See this article for a full walk through of setting up Cubase LE 7 with the M-Track Eight! Yes! 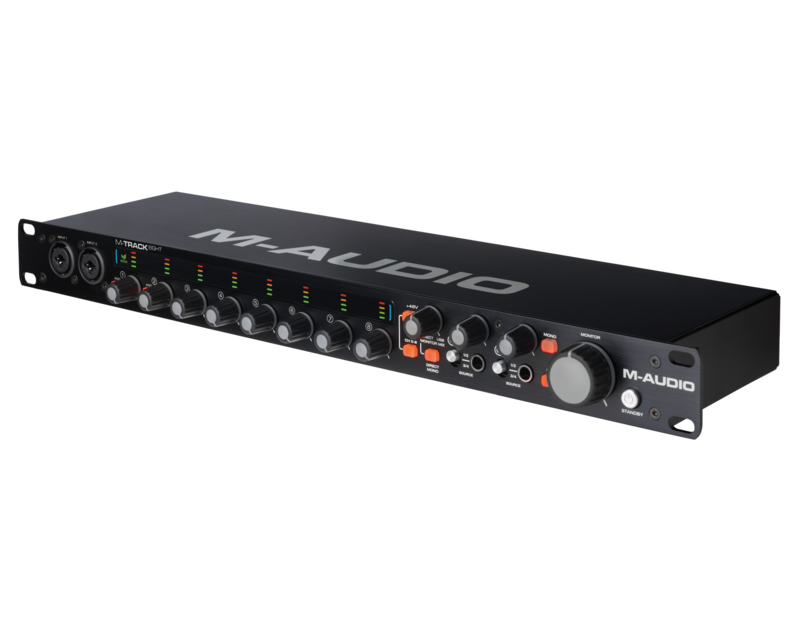 Virtually any Mac OSX or Windows Digital Audio Workstation software capable of using USB audio interfaces will work with the M-Track Eight. Can I use an external microphone preamp or direct box with the M-Track Eight? Yes! When connecting an external mic preamp, direct box, or any other type of preamplifier to the M-Track, use a 1/4" TS or TRS type connector as this will bypass the M-Track Eight's internal microphone preamps. Only use an XLR type connection for microphones. To achieve optimum input levels, adjust the input gain while the source (microphone, instrument) is receiving the loudest signal. For example, have a vocalist sing through the loudest section of the song. At this loudest point, you should see one or two green LED lights. Drums and other percussive sources may occasionally display the yellow light. The red light indicates the input gain is set too high. The meters are calibrated relative to 0dBFS, which is the point of digital clipping. Connect your speakers or studio monitors to the MONITOR OUTPUT. This output will be controlled by the large MONITOR knob on the front panel. The other 8 outputs of the M-Track Eight are assignable from the outputs of your audio software (ex, Cubase LE7). All inputs and outputs on the M-Track Eight can accept both balanced and unbalanced line connections. Note that only XLR and TRS type connectors carry balanced signals, while TS and RCA type connectors are always unbalanced. Mac OSX has a separate, internal volume control. 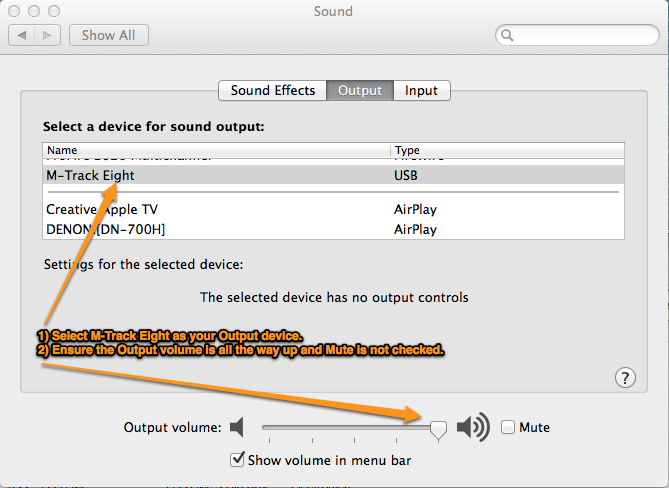 We recommend keeping this all the way up in your Mac's System Preferences > Sound > Output menu. On some Macs, you may also control the volume with the function keys on the keyboard. Yes. The M-Track 8 will be very warm during normal operation, but will not burn the skin when touched. Preamps of this design and quality require a good deal of juice to operate (19V 2.37A in this case).